Is the universe defined by empire or by its own principles? 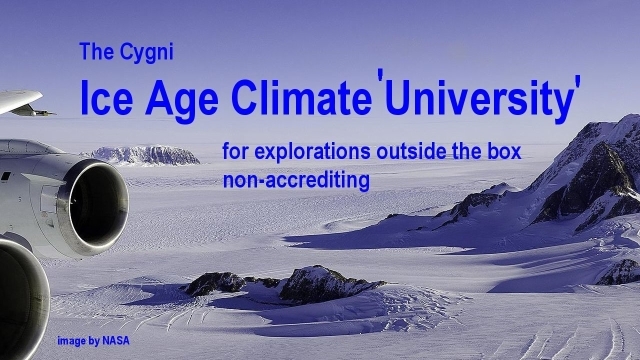 Exploring an alternate theory for the Ice Ages, and of the Sun as the cause for them. I am presenting a new video production, in honour of the "Belt and Road" world forum in Beijing, China, on May 14-15, 2017, designed as a win-win platform for economic development - peace and security building on the foundation of international cooperation and universal prosperity. My video explores the foundation on which the project may ultimately succeed. The 'cake walk' by Napoleon into Russia, in 1812, became a disaster that killed the Grand Army and subsequently sank the French Empire. 680,000 soldiers walked to their death, oblivious that the glory of empire is not a sun, but a trap. Humanity is on the same track, oblivious of the near Ice Age, trapped by a false theory of the Sun that was created by empire in its image. Will still have a chance to follow the 1813 path (implemented in Europe) to freedom. The music for this video has been selected in honouring the historic significance of the Palmyra concert. 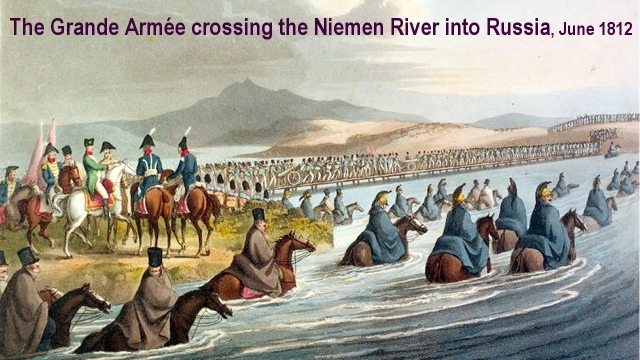 On the 24th of June 1812, Napoleon's Grande Armée of 420,000 men, crossed the Niemen River into Russia. It was to be a cake walk. It became a disaster instead. They came to defeat the Russian army; to force Russia's surrender. wanted a land-route to conquer India. The British ruled the seas. With it, they owned India. Napoleon wanted India for the French. For this, he wanted to compel Tsar Alexander, who was legally an ally of France, to give up his control of Russia to him. 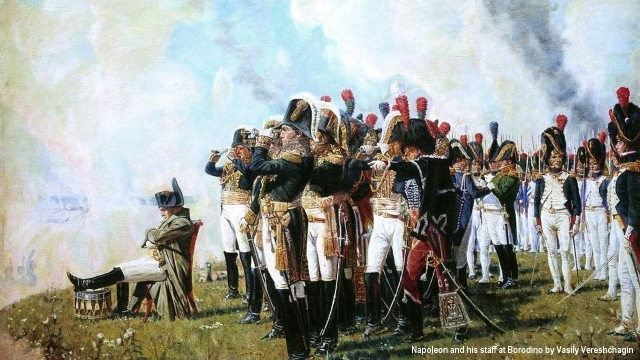 After Napoleon had defeated the Russian army in 1807 in the Battle of Friedland, France and Russia had signed the Treaties of Tilsit that had made the two countries allies. The treaty prohibited Russia from doing business with Britain, which Russia ignored. The breach enabled the objective for regime change to be forced. 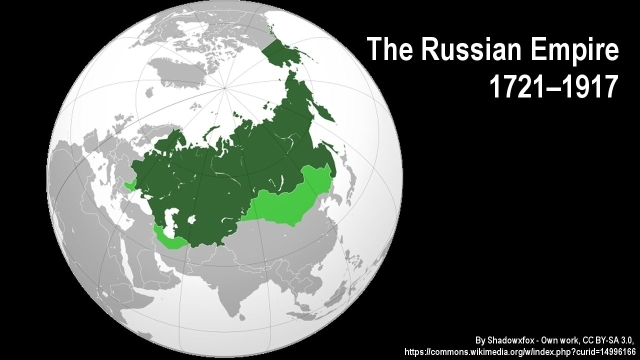 The official excuse for the invasion, of course, in typical empire fashion, was that the invasion of Russia was necessary to liberate Poland from the Russian threat. Militarily, the invasion was a cake walk. Russia had no military might to speak of, with which to counter the 'civilized' forces of the French Empire. It was a cake walk also, because the Russians had refused to fight. They would have been slaughtered. Instead they retreated. Their refusal became their liberation. The war was decided by logistics, not heroics. Napoleon lost the war by the lack of logistics. The massive invasion encountered a land of poverty with squalid living conditions and teeming with lice. Lice are carriers of the typhoid. Napoleon lacked the logistics to counter this force. An alert person would have seen the writing on the wall. Napoleon was defeated by the system of empire, a system of 'civility' that disregards the human dimension, and the common aim of all mankind. For empire, the goal is stealing. Wars are fought to open the doors to stealing. The Russian gave him a burned landscape that contained no food, lacked water, and offered no fodder for the horses either. Blinded by his own ideology, the ideology of empire, Napoleon walked into a trap that he could not see, nor his advisors could see, who were similarly blinded. 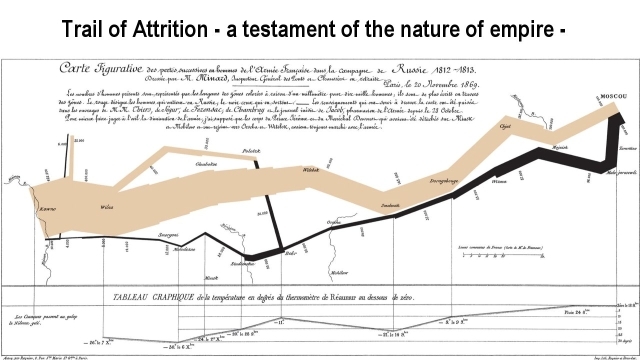 The Russians won the war by simply drawing Napoleon deep into the country while disrupting the supply trails. The Russian defenders literally watched the Grand Army to defeat itself with diseases and hunger. They literally watched it starve itself to death. The transportation infrastructure didn't exist to support the supply system for a large army. Roads, frequently became rivers of mud. The long train of heavy wagons forged deep spoors in the mud. Wagons sank to their axels into the road. And on days when the Sun broke through, the mud became hard. The spoors became canyons. The horses broke their legs in them. At the end of the 1st week, the Grand Army had left behind along the road a trail of 10,000 dead horses. 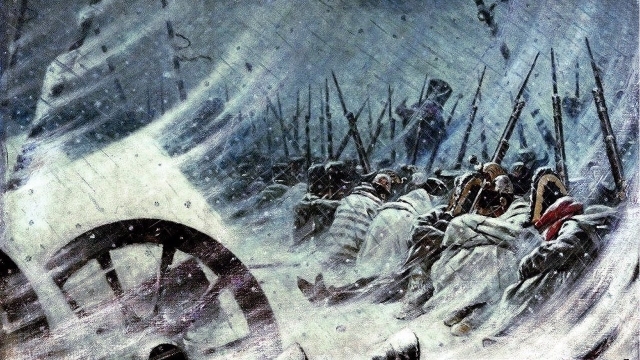 Some say that it was mostly the Russian winter with its minus-30 to 40-degrees temperatures and high winds, that had defeated Napoleon. This is not true. 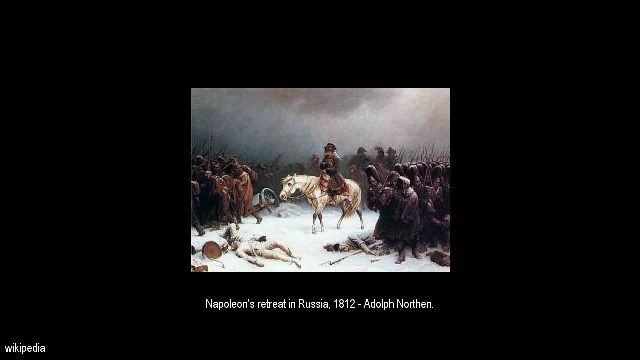 By the time Napoleon had taken Moscow, he had fewer than 100,000 men left, out of the 680,000, that he had brought into Russia. And for what? His victory had been denied. He had conquered an empty and undefended city that was set ablaze within days under his very nose to deny him the facilities of civilization. 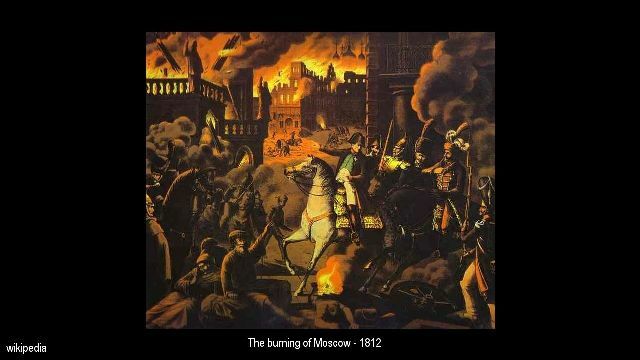 Most likely it wasn't the burning of Moscow that eventually forced his retreat. The collapsing logistics and the rising pandemics may have impelled that. 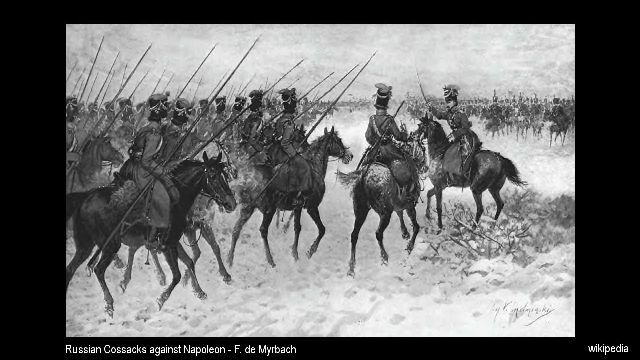 Napoleon had received 15,000 reinforcements to bolster his position in Moscow. Of these 10,000 died of diseases, within the destroyed city. The cold may have killed half of the soldiers that eventually vacated Moscow. Without protective logistics it doesn't matter whether the cold drops to minus 20 or 40 degrees. The Grand Army had come in summer clothing. The worst fate was for a man to fall asleep in the icy winds and in 30-below weather with driving snow. Those who surrendered to sleep, never woke up. No one had the strength left by then to help others along. The road home became littered with their frozen corpses. Some say that 1,000 to 4,000 soldiers had made it back home as able men, of the 100,000 who retreated from Moscow. The rest fell by the wayside. This means that almost no one had survived the six-months long epic of dying , of the 680,000 men who had waged war on Russia. 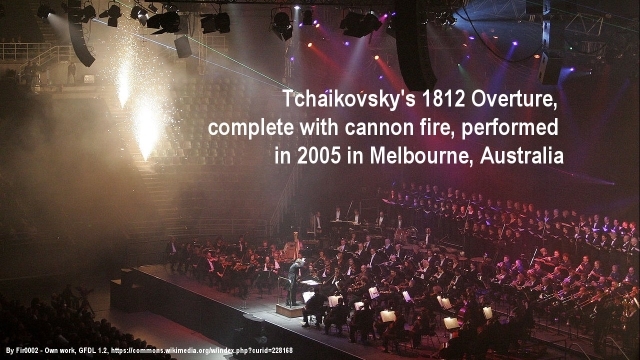 Tchaikovsky's great 1812 Overture, commissioned to celebrate Russia's victory, ends with the boom of cannon fire incorporated into the heroic-style music. But this isn't how the war was won. Napoleon was not defeated by heroics, but by a dead poet and the quiet rustle of lice, the growls of empty stomachs, and the freezing of soldiers who fell asleep standing. Nevertheless, the Russian victory was not a passive victory. It was an active victory right from the start that was designed to protect the most precious asset that a nation has, which is its people. The capital city was sacrificed to protect the most precious. 'A city can be rebuild when the nation is preserved,' was the heart of the message of the poet. The cannon-fire of the celebration symphony likely do not represent the explosions of war, but the exploding fire of humanist ideals, ideals of truth, that end wars. Mostly, however, Napoleon was defeated by the ideology of empire itself that had inspired the invasion of Russia in the first place. 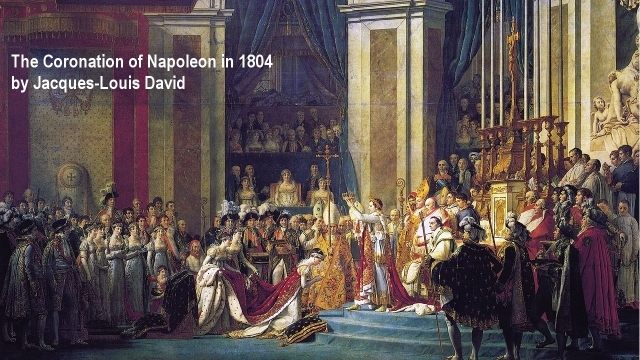 Napoleon was defeated by his blindness, that was symbolized by the crown that he wore. He could not see the human dimension that is blocked by this barrier of gold. Blind as he was, he saw a military victory within reach. Had he read the writing of Friedrich Schiller, the German poet of freedom, he would have chosen a different type of victory, the victory of economic development in cooperation with Russia, instead of the victory of the grave that buried his finest men and his opportunity to make his name a great and honourable one. Napoleon had denied himself and the people of Western Europe the only possible type of real victory that is possible, built on advancing the most precious that a society has, which is the creative and productive capacity of the human being. The Russian leadership chose this type of victory - a victory that is inherently possible by the principle of our humanity. Ultimately, victory is not possible on the side of empire, which is itself but a fading dream. but a false ideology, a dream, a void. 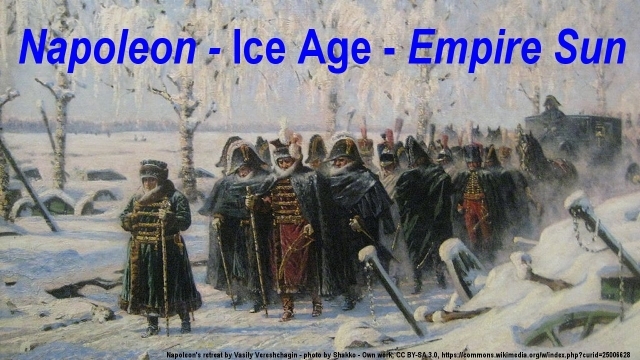 The people who strode with Napoleon all ended up dead, defeated by the myth of Empire as the rising sun. The whole of humanity is on that bridge. Humanity follows the flag of Empire, oblivious of the ice age before it, which will be its doom, because the infrastructures are presently not being built that support human living in an ice age world. Empire is deadly. It is a belief in something that is not real. Empire parades itself to be a Sun, a Star of Glory that shines by its own power and merit. It pretends to symbolize grandeur, riches and civility, while unseen, at its core, it is devoid of humanity. 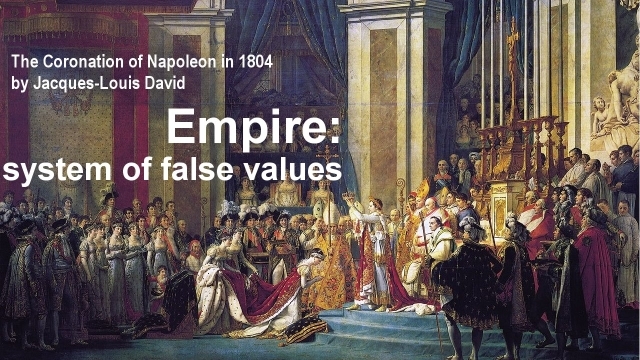 Empire: a system of false values. Hiding behind its gilded facade, Empire is a force directed against humanity by which empire dooms itself as the only declared enemy that humanity has. Its real name is war. All wars are by Empire, for Empire, and on behalf of Empire, or against competing Empires. Empire and war is one. 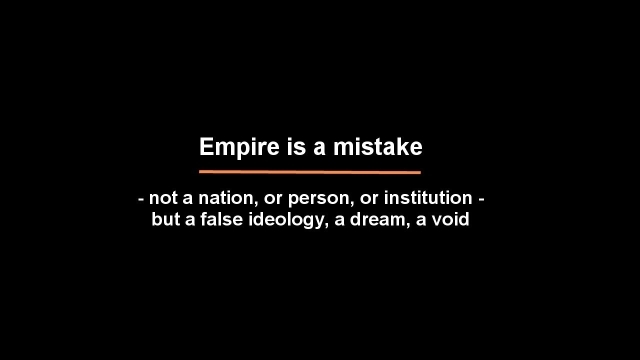 Empire is a force deployed to blunder, subdue, and to steal, instead of to create, to produce, and to build. By this, empire itself is doomed. Empire is also the enemy of science, and the only inherent enemy that science has, and ever will have. This may be the reason why in modern time, the star for the Earth, our astrophysical Sun, is being paraded on posters with a false face. It is portrayed with a face of which nothing is actually real, but which reflects the nature of Empire through and through. It would be surprising if this wasn't so, because anything that Empire creates is a paradox onto itself. But there is light at the end of the tunnel - a light as symbolized by the cannon fire of the 1812 Overture that appears to celebrates the explosion of truth over what would suppress it. The Empire Sun poster is strung across the landscape of science. It parades the Sun in the form of a sphere of hydrogen gas that is self-powered by nuclear fusion reactions occurring at its core. This Sun is deemed to exist disconnected from the universe - self-made, as its own master, burning its own fuel, subject to nothing, invariable, unchanging, and forever constant in its operation. Isn't this also what empire says about itself, in essence? 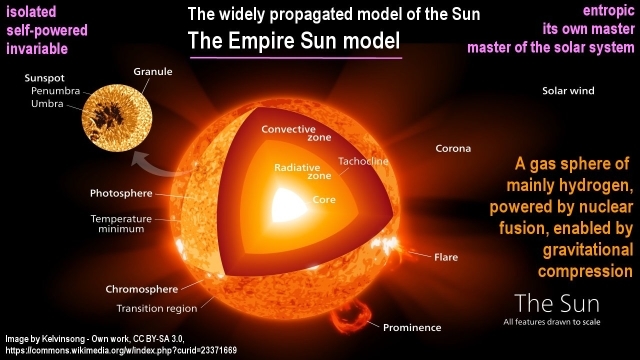 It is not surprising in this context that empire has devised a model for the Sun that mirrors its own image, a kind of astrophysical model that reflects the nature of empire. The model that resulted isn't likely a conspiracy. It is most likely honestly derived. In fact it would be surprising if the Empire-created an image of the Sun that did not reflect in principle the characteristics of the system of empire. Empire paints the world with the colors of its ideology. Every great artist paints the images of the world as they appears in the artist's mind. 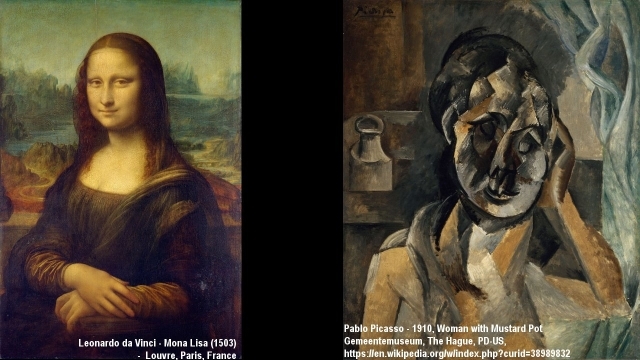 In this context, the paintings of Leonardo da Vinci and Pablo Picasso portray different views of the same object, seen through different eyes, shaped by different ideals. It would be surprising if this differentiation in characteristics didn't exist. This applies to science likewise. The masters of empire who control the sciences, just as they control nations subversively, are invariably steeped in the ideology of empire that they serve. As a consequence, the empire-created poster of the Sun and its operation bears the reflected image of the ideology of empire. It serves a specific objective instead of the truth. The disorientation has consequences of course - sometimes extreme consequences. Some of these are intentional. Under the Empire-Sun model - and I mean "empire" in the generic sense as a system of thinking that stands poised in the modern world to repeat the Napoleonic plunder of 1812, though on a vastly more--gigantic scale this time around, humanity is enticed into a type of dreaming in which the Next Ice Age is denied, even while it stands deadly poised and as close as the 2050s. The induced dreaming that the Ice Age is neither real nor near, is dangerous, because the sleep state blocks all efforts for building the necessary infrastructures in preparation for the coming conditions. Living oblivious of the truth, under the 'flag' of the Empire Sun, the greatest danger to society's existence as the Ice Age looms before us, is being swept under the rug. 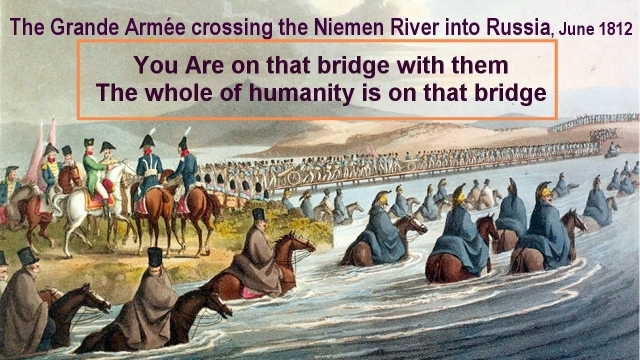 It was the same for the soldiers who were crossing the river Niemen into Russia. They were oblivious of the doom they were led into under the banner of Empire that projects a myth of glory that is fundamentally a lie. Oblivious in the same sense, humanity is poised to re-experience the doom of this folly in the near future; in a world without food, scorched landscapes, and evermore unbearable drought and cold. 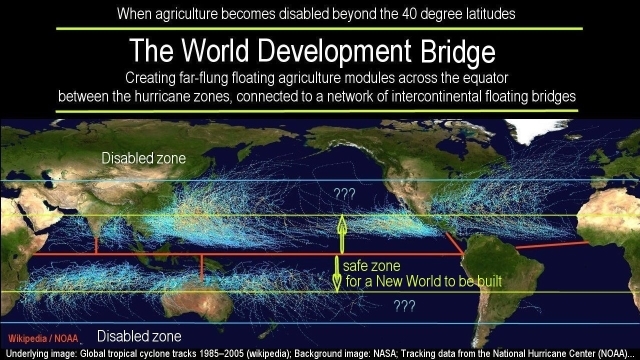 That this fate is near, is evident by the fact that the infrastructures are not being built that enable agriculture and human living to continue in an Ice Age environment. We have a chance today, in our time, to avoid this doom - a chance that the soldiers on the bridge did not have. 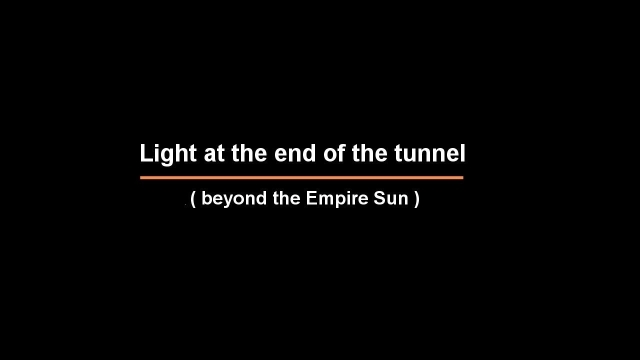 Light at the end of the tunnel - beyond the Empire Sun. We have a chance today to discern the Real Sun. The Real Sun is different from the Empire Sun in every respect. The Real Sun is vulnerable; variable; a sphere of plasma that is largely empty inside and is energized externally by principles that render it as an integrated element of an anti-entropic universe. On its surface, the largely empty Sun is teeming with energetic electric interactions. 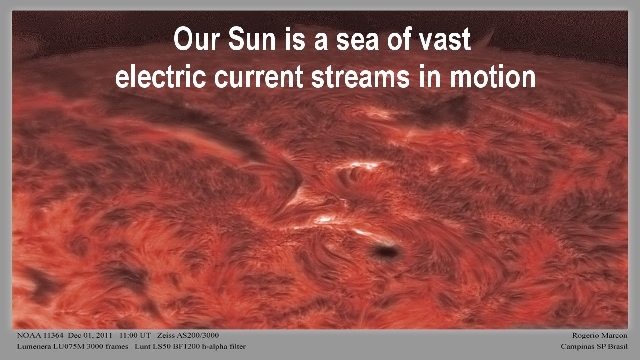 This turbulent sea of electric currents flowing in plasma is not of the Sun's own creating. It merely facilitates it, as a catalyst for it. 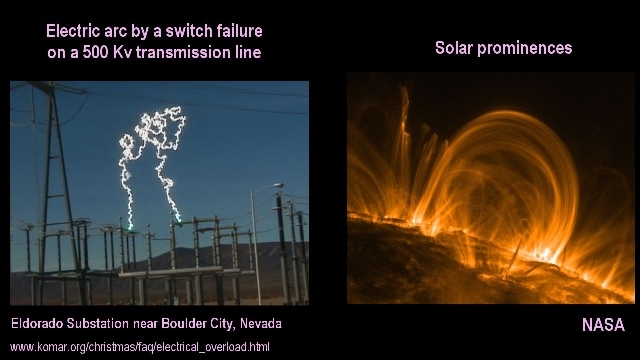 Also, wherever electric movements happen, magnetic phenomena follow. All magnetic phenomena are electric effects - they are the effect of electric particles in motion. The Sun is covered with them, even while it is empty inside. But what proves the seeming 'paradox?' What proves that our mighty Sun is empty inside, so that what we of it, is but skin-deep? The proof of the seeming paradox is located in one of the Sun's smallest features that all by itself closes the door on the Empire Sun model. 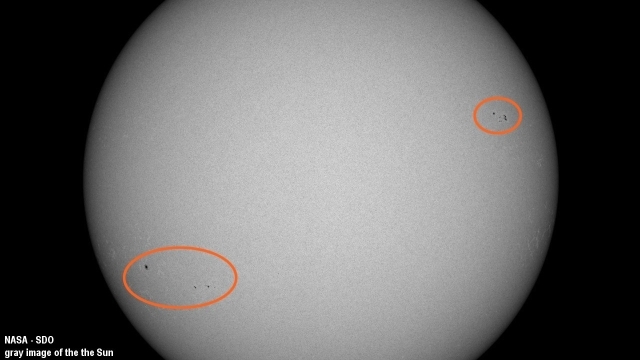 This feature is the sunspot. 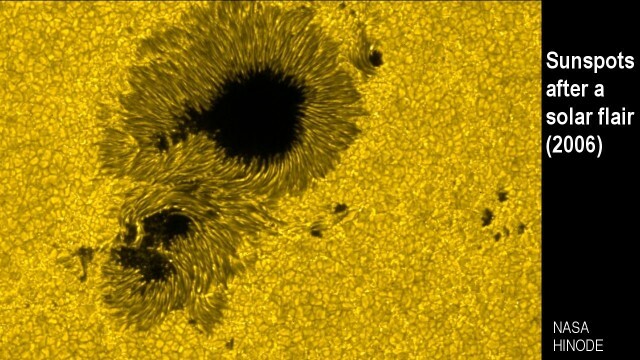 The sunspot is a dark spot on the face of the Sun. It results when a hole is ripped into the shiny surface of the Sun. Whether the sunspots are small in size or large, or many or few, they all share one common characteristic. Their umbra are dark, because nothing exists below the shiny surface. No matter how closely we look, and how much we expand the view, we always look into a void when we look through the umbra of a sunspot. Paradoxically, what we behold in the void, is a key feature of the very existence of the universe. If one was given the task to design the perfect universe, created out of nothing but energy and principles, one would end up with the kind of design that we actually have before us. 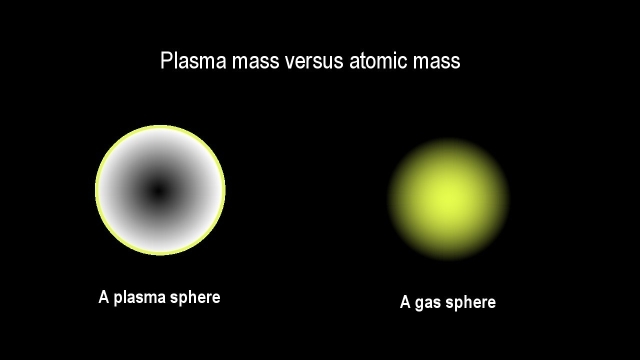 Throughout the universe, 99.999% of all mass exists in the form of plasma. Plasma is the term for the basic building blocks of the universe, termed protons and electrons, existing in unbound form. The electrons and protons themselves are recognized to be constructs of quarks, of up-quarks and down-quarks, and so on. 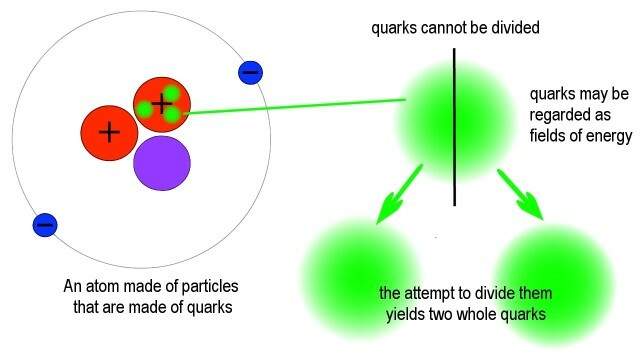 Quarks are understood as but moving points of energy. This means that all plasma, and all atoms in the universe are derived from them. And the quarks themselves are but explicate features of the implicate order of the energy background of cosmic space. 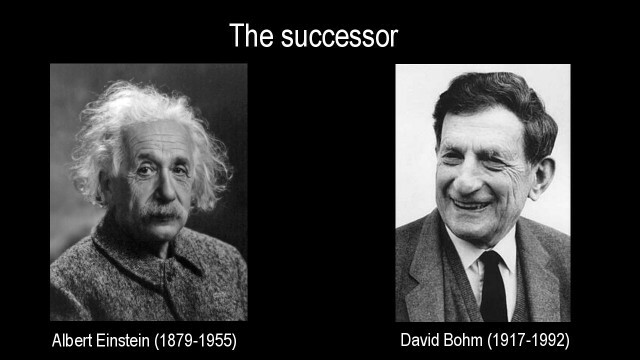 That's how the great theoretical physicist David Bohm had perceived the universe, whom Einstein once referred to as his successor. 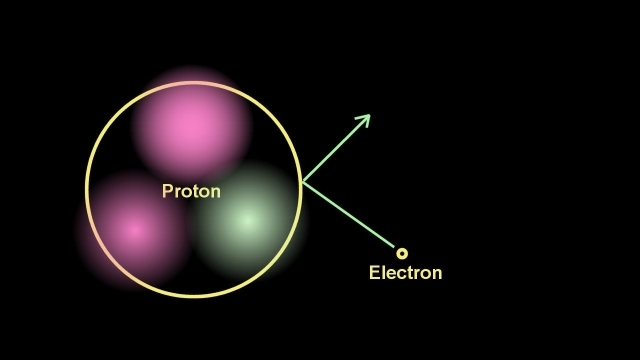 The specific arrangements of the quarks are recognized to give the electrons and protons their electric potential - positive for the proton, and negative for the electron. By the resulting electric potential the unlike plasma particles, by their complementary nature, attract one another with the electric force of the universe. 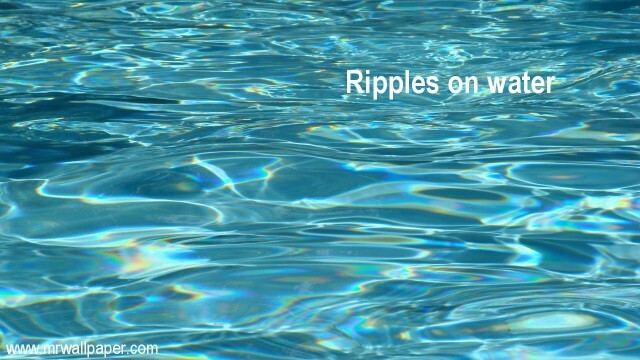 With the same force, particles with equal charge repel one another, which creates more room around them. However, the universe doesn't allow the complementary attraction to go so far that the attracting particles latch on to each other. At very close distances, a strong nuclear force from within the combination repels the two apart. Without that we wouldn't have a dynamic universe. After the electrons bounce away, they are promptly attracted again by the electric force. 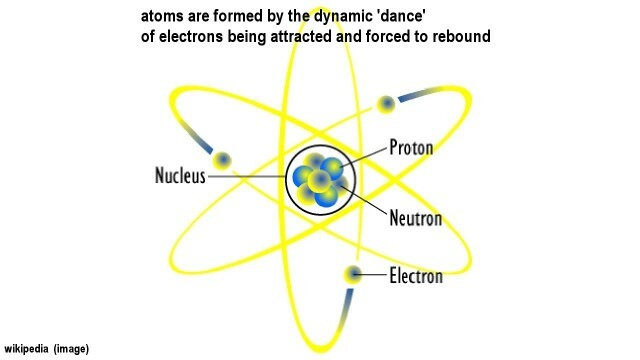 The end-result is that the electrons in plasma, which are 2,000 times smaller and lighter than the protons are, are drawn into an endless dynamic dance of attraction and repulsion, around the protons. On this basis plasma becomes bound up into atoms that subsequently form the planets and everything on them. When plasma exists in unbound form in dense concentration, the free dancing of the electrons forms an electric barrier between the free protons. 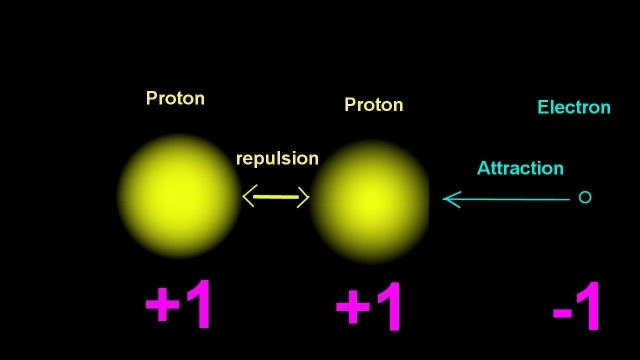 The barrier inhibits the protons repelling one-another. Paradoxically, this insignificant-seeming feature has a world-shaping effect. 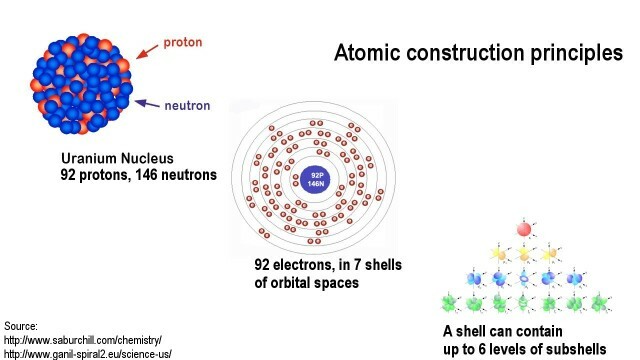 The result is that extremely dense concentrations of mass can be forged that way, with a greater density than atomic packages can have, by the electrons shielding the protons against their repelling force. 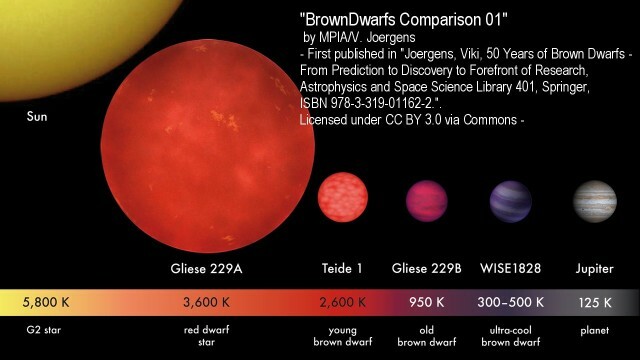 The brown dwarf star is an example. Brown dwarf stars are typically of the size of Jupiter. However, they can contain up to 75 times as much mass as Jupiter does. This makes them the densest objects that we know of, with an up to 15-times greater density than the Earth. However, in extremely large concentrations of plasma, gravity begins to play a role too. With the protons being nearly 2,000 times heavier than the electrons, the lighter electrons tend to migrate to the surface, like marshmallows do on milk. The migration of the electrons away from the center of gravity, enables the needed high-electron density on the surface of a sun that is required for a sun to function. It also enables the protons in the core of a sun to see each other more strongly, and thereby repel each other more strongly, whereby a very- large plasma sphere results has the lowest mass density at its core, and the highest density at its surface where the greatest electron density ends up, which makes the resulting sun an extremely reactive electric catalyst. This principle of electron migration is evidently one of the most-critical features of the universe, because it enables extremely large stars to exist with an extremely low over-all mass density. 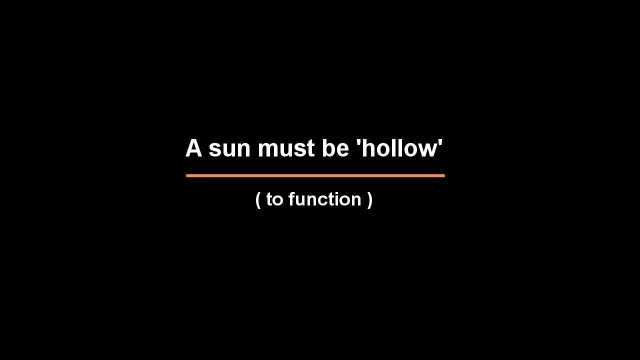 The resulting inverse ratio enables a sun to have the kind of extremely large surface area that would otherwise not be possible. A sun must have a large surface area in order to be able to radiate large volumes of energy. The principle defines the apparent paradox of our Sun being an extremely radiant star, and at the same time to be an almost empty star. A sphere of atomic gas, in contrast, lacks the electric features of plasma. 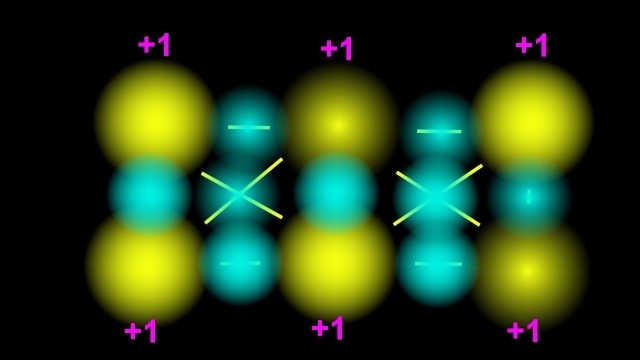 Atoms are electrically neutral structures. They have no external electric effects. They have their constituent plasma particles tightly bound up into electrically balanced, electrically neutral, units. For this reason, plasma in the form of atoms, can be packed together more densely. 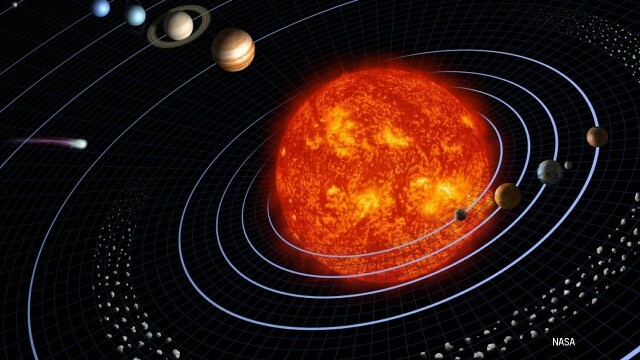 This means that a sphere of atomic elements where gravity is the dominant force, like that of a planet, or of a gas planet, always has its greatest mass density at its core, by gravitational attraction, and the least density at its surface. Paradoxically, the resulting density gradient renders a gas sphere unsuitable for being a sun. It actually renders the Empire Sun, physically impossible. A gas sphere is limited in size by the maximum possible gas compression without the inner atoms being crushed. This limit is overruled in the magical land of the electron degeneracy theory. Outside the land of magic, the compression limit renders a hydrogen gas sphere too small to ever be a sun. If our Sun was a gas sphere of equal mass, it would be merely a tenth the size it is, if such a dense sphere of gas could actually exist. 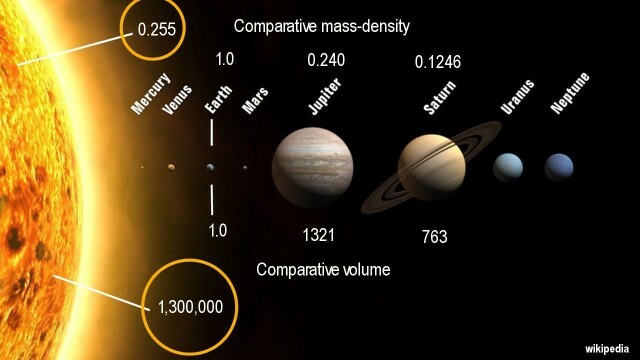 In comparing Jupiter with Saturn, Jupiter, which has double the volume of Saturn, also has double the mass density. The greater mass-density reflects Jupiter's stronger gravity that results in stronger gas compression. But when one compares Jupiter with the Sun that has a thousand times greater volume than Jupiter, its mass density should likewise be a thousand times greater. But this is not the case. 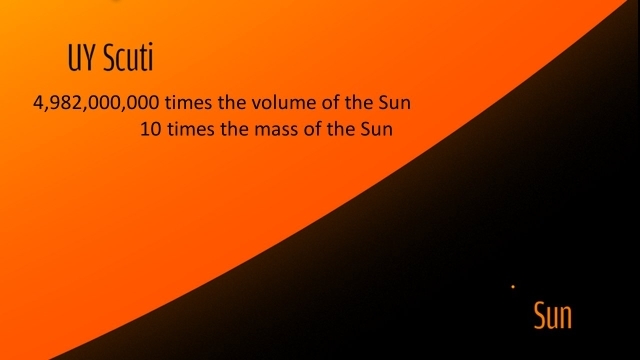 The mass density of the Sun is roughly the same as that of Jupiter. How is this paradox possible outside the box of magic? The answer is that the Sun cannot be a gas sphere, but is an empty shell of plasma. with nothing substantial inside of it? Its extremely light weight is justified thereby. This is also what we see with our own eyes when we look through the umbra of a sunspot on the Sun, which reveals the Sun as dark inside. Magic would have us see 'dark energy' that blots out light, streaming through the hole in the surface. Without magic, however, we see a dark void, because there is essentially nothing there to be seen below the surface of the Sun. Indeed why would we see anything different than what we see, with the Sun being an essentially empty sphere that is externally powered? Astrophysical measurements tell us plainly that our Sun cannot be anything else than a largely empty shell of plasma, like an electrically inflated balloon. The paradox is further resolved if we consider the extremely large star UY Scuty, the largest star that is known. It is deemed to contain 10 times as much mass as our Sun. But this mass is dispersed in a sphere that is 1,700 times larger in diameter than our Sun, which makes it 5 billion times larger in volume. In this 5 billion times larger volume, the 10 solar masses almost disappear. As one researcher has put it, the star's mass-density is so low, that it is practically a vacuum. 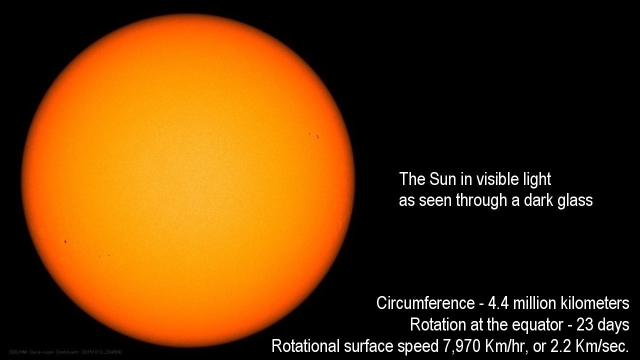 This simple fact takes us far away from the gas-compression model of the Empire Sun, especially when we consider that this giant sphere of 10 solar masses, dispersed so thinly that it is almost a vacuum, is observed to be 340,000 times more luminous than our Sun. 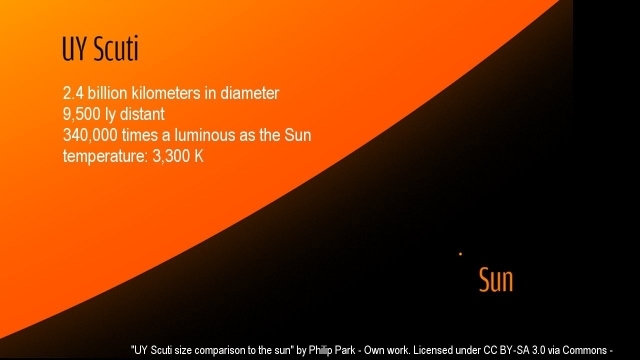 Such a giant star is not possible under the gas-compression nuclear-fusion-sun model. Paradoxically, it exists. We can see it. We can measure it. It is real. It exists, because as a plasma sun, the giant star is not paradoxical at all, but illustrates the natural dynamics of plasma physics. It is totally possible under the plasma model for the largely-empty giant star of 10 solar masses, to outshine our Sun 340,000-fold,. 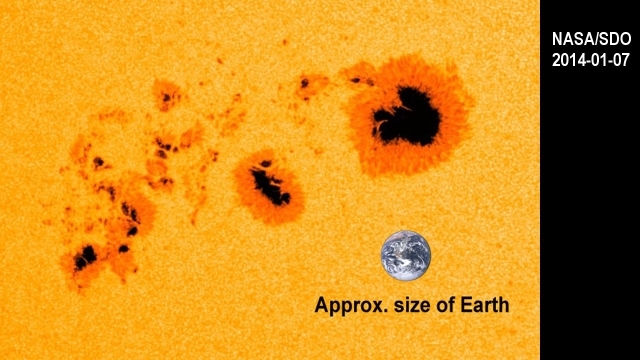 This is so, because its radiated energy is not produced within it, but by plasma reactions occurring across its nearly 3 million times larger surface, than that of our Sun. That's where the radiated energy comes from. On this basis the numbers add up. The recognition enables us to break away from the Euclidian reductionist kind of thinking where everything is based on what one can see, where cause and effect are conceptionally isolated. Of course, the universe isn't isolated from itself. This myth exists only in the box of reductionist thinking. In real terms, the opposite is true. 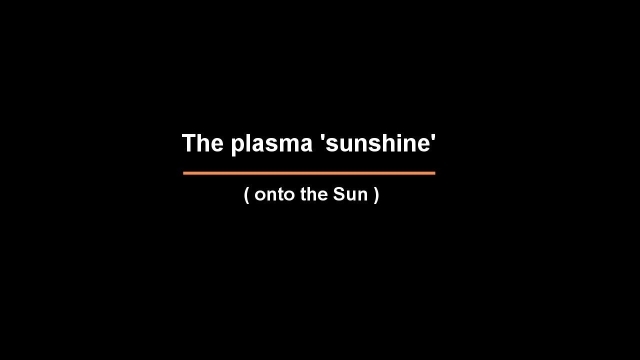 The plasma 'sunshine' onto the Sun. 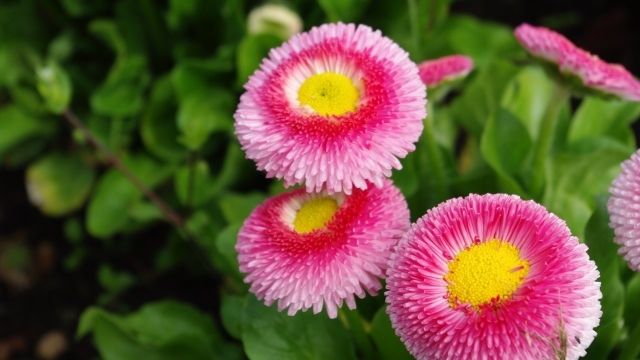 Just as streams of sunlight flood the earth, and illumine the landscape, brighten the flowers, so stars are 'illumined' in cosmic space by plasma streams 'shining' unto them. 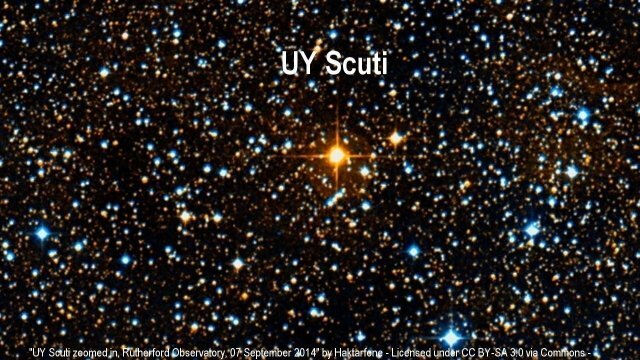 UY Scuti is immensely luminous, nine and a half-thousand light-years distant. It is that, because it exists as a huge canvas that has plasma 'shining' onto it, which it radiates back in the stellar 'colors' of atoms, light, and cosmic rays. We need a university type of approach to be able to see with the mind past the reductionist mysticism where everything is deduced from the most primitive platforms and reduced to them, where nothing else is deemed to exist. That's like a person walking through the world with its eyes closed, who is thereby effectively blinded. Inversely, with the eyes of the mind fully open, the real world comes into view with new vistas, vast opportunities, and revolutionary implications that otherwise remain unseen. I chose the name Cygni for my own 'university' type explorations beyond the fog of Euclidian reductionism, in reference to the star Cygni, the second-largest star known. It is 1100 times larger than our Sun and has up to 50 solar masses spread across its sphere that is 1.6 billion times larger in volume than the Sun, and outshines the Sun 272,000-fold. 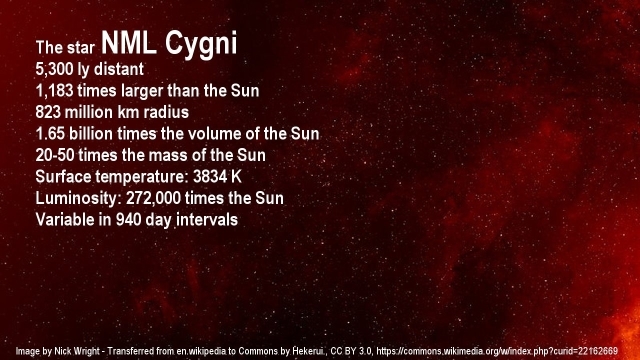 However, Cygni is a star that no one has actually seen. It exists hidden in a dense nebula that is evidently of its own creating. Cygni can only be seen with the mind, and be detected with advanced instrumentation that expands the range of our perception. The Empire-Sun poster has the opposite effect. It takes the Sun out of the universe and then aims to explain how this this disconnected star is able to shine. The theory poses a problem and then solves the impossible with magic and mysticism where nothing is real.